Service First Video Library | Shoppers, Inc.
We have just upgraded the Service First Video Library with a 2017 Copyright. Preparedness breeds confidence and your customers look to sales associates to validate their purchases through expert knowledge, assuring them your business is best suited to satisfy their needs as a consumer. 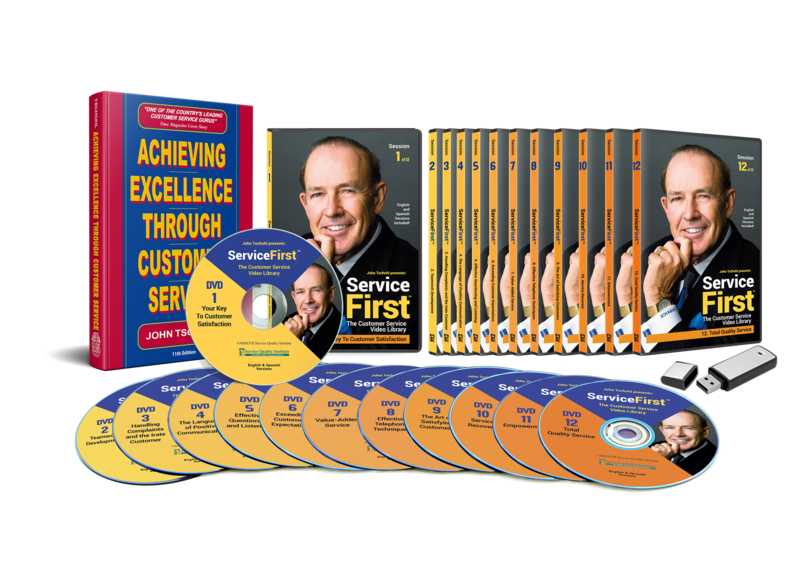 With the Service Quality Institute’s innovative Service First Video Library with 12 short 15 minute DVD’s or one flash drive, your associates will learn the interpersonal communication skills needed to navigate each customer interaction effectively. It comes with unlimited use of the facilitator and participant material. The Service Quality Institute’s unique approach uses 12 weekly lessons that scaffold the knowledge base your business needs for success, developing a functional, in-depth insight into customer relations by building a strong foundation. Each 15-minute lesson focuses on a particular customer service topic, and doubles as an effective tool for both educating employees, and building a team dynamic. By bringing employees together in a constructive environment where they can hone in and develop existing skills while improving others, your customer service team will function as a unit. They will develop a unified consumer culture around your business so that your customers always expect the same level of exemplary service. Take a moment to view the samples provided below, and explore some of the key topics covered in our Service First Video Library program. The Service First Video Library keeps employees motivated, focusing on quality service, and working as a team through constant reinforcement. It keeps customer service uppermost in their minds when on the job. More importantly, the videos enhance the service skills and job performance of all your employees. The goals of the Service First Video Library are not simply to change the habits of individuals, but to strengthen a company culture built around service. It’s affordable, easy to implement quality service training. It’s so user friendly you don’t have to invest in experienced facilitators…anyone can train this program!